If I had unlimited funds, I would never stop shopping. It's become instinctual for me to check the New In sections of all my favourite fashion retailers when I open my laptop in the morning. I can't help it. Sometimes, I'm just in the 'buying' mood - I peruse my favourite sites and wait for something to jump out of me. You can't deny the fabulous rush of adrenaline when a lovely packaged delivery arrives at your door or something catches your eye on a sparkling shop floor. I've never taken drugs, but for me, shopping is my natural high. But therein lies the problem. As much as I love fashion - I'm surrounded by beautiful clothes day in and day out - there's never an end point. Your wardrobe is never finished or complete. Instead, it's a constant work in process - always evolving in a desperate attempt to keep up with the current trends. It's exhausting really. It makes me wonder - who are we trying to impress? I acknowledge the seasonal trends. After all, the catwalks ultimately dictate what we wear whether we like it or not. But who wants to be a slave to fashion if it doesn't make you look or feel good about yourself? My personal mantra is that you should wear what you like. Whether that means slouchy knitwear because jumpers are snuggly or your favourite boyfriend jeans because they're the most comfortable things in the world, if you're happy with your outfit then who is anybody else to judge. My problem is is that I like clothes too much. Correction: I love clothes and I'm forever buying something new. When the adrenaline wears off and you see the gorgeous new dress you just had to buy in the light of day, it's onto the next hit. This used to mean hitting up the Topshop website for something new and exciting. Now that I'm working in retail, delivery day is my kryptonite. You get to unpack the lovely new clothes as they arrive from the warehouse and see what they look and feel like in the flesh instead of behind a cold computer screen. Trust me, it's so much better. I've been in this job for about five months and I dread to think about how much I've spent in that time. Seriously, it's scary. On a more upbeat note, I'm moving to Southampton in a little less than a month! I cannot wait to be a student again and start studying the subject that I love. I've majorly neglected my beloved books these past few months so it's definitely time to get back into the swing of things. But I have set myself one mammoth task to complete before I leave. I need to be ruthless and firm and give my wardrobe a good ol' fashion clean-out. Think of it as Autumn cleaning. I want to have a completely fresh start for uni and that includes throwing out some very battered and out-dated horrors from my abyss of a closet. When I left for uni last year, I just chucked everything in a humongous suitcase and didn't give it a second thought. So this time I'm doing it properly. After all, a healthy wardrobe makes for a healthy mind - at the moment, mine is suffering from life-threatening obesity-related issues. With this huge lifestyle change fast approaching, I think it's the right time for a cleanse. Besides, if I do it right then I might even treat myself to some Fresher's Week goodies. Topshop's new season is looking fabulous. I can picture myself pairing this Leopard Print Pelmet Skirt with a slinky black cami for a night out or a pair of ankle boots for a morning seminar. 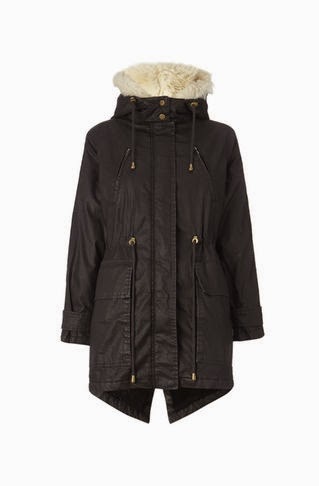 While I've simply fallen in love with this cosy, slouchy parka from Whistles. I love the drawstring detail at the waist which means you can give yourself a more feminine and defined shape - this clever design has combatted the often frumpy look of other big parka jackets. For me, it's a must-have.